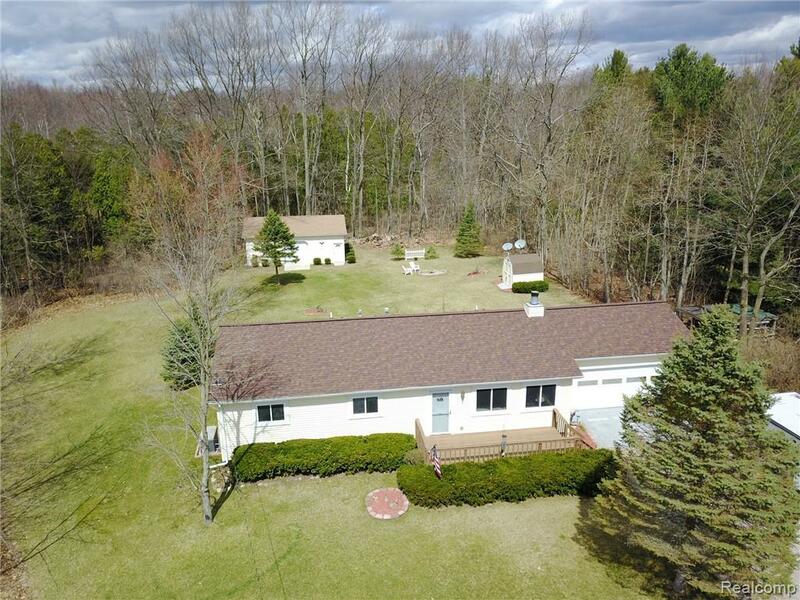 Amazing opportunity on this meticulously maintained 1989 Stick built ranch home on a serene private wooded 1 acre lot. Paved road and natural gas yet still close to town. Lots of updates including windows--transferable warranty, roof--transferable warranty, newer furnace, kitchen updated with quartz counters. Master suite has own private bath and large walk in closet. Natural wood fireplace in living room. 2 car attached garage is heated and has epoxy floors. Also features a 26x32 pole barn too great for storage or workshop. Includes all newer appliances and a newer hot tub. Spacious back deck to enjoy your serene setting. Also comes with a full home automatic back up generator powered by natural gas--never lose power again. This home has so much curb appeal and shows so well only one showing is all it will take. In this market don't wait--it likely won't last.